With a brand new year fast approaching, you may be wondering whether the new calendar will have any impact on your dental insurance plan. Do dental benefits carry over into the new year? The short answer? No. Most dental insurance plans do not carry over into the new year. This means that if you don’t use your designated coverage for the year before 2018 ends, you lose your benefits, and start over again in the new year. 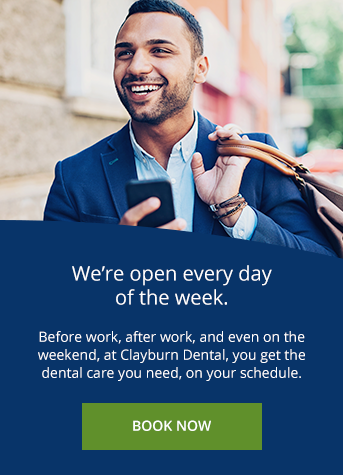 Clayburn Dental in Abbotsford, BC accepts most dental insurance plans, and we have some advice to help you make the most of yours. If you have dental insurance, you will receive certain dental treatments free or at a discounted rate in exchange for your premium, which is the amount paid to your insurance company each month. Most dental plans have an annual maximum. This is the amount your insurance provider will pay for your care during a specific period — usually a calendar year. In other words, your dental insurance will reset in 2019, so it may be wise to take advantage of the benefits you are eligible for in 2018, while you still can. To maximize your dental coverage, you must first know what you’re eligible for. The best way to figure this out is by talking to your insurance company or, if you’re covered by you employer, talking to your human resources department. Which services are completely covered and which are partly covered? How do I receive the discounts on my dental care? What treatments have I received in 2018? Regular preventive dental care is the key to preventing oral health issues and the need for more invasive, extensive and costly treatment in the future. For this reason, most dental insurance plans completely cover two check ups and cleanings per year, as well as a set of x-rays. Prevention saves them money in the long run, and it saves you a lot of hassle and discomfort, too. So, if you haven’t taken full advantage of your dental coverage this year, it’s time to schedule an appointment with one of our Abbotsford dentists. Your future self will thank you!